Whenever Island Creamery is being mentioned, the first image that I have is that cosy hideout at Serene Centre, tranquil and peaceful, perfect for being the after dinner comfort food. It was and probably still is a popular hideout for many students after school due to its convenient location close to Bukit Timah Road. 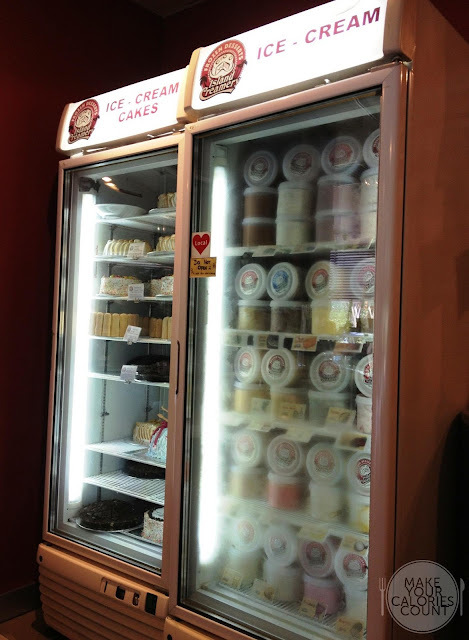 Swearing by its premium freshly made ice cream, Island Creamery was Singapore's first local ice cream parlour in offering local flavours such as 'Teh Tarik' and 'Pulut Hitam'. 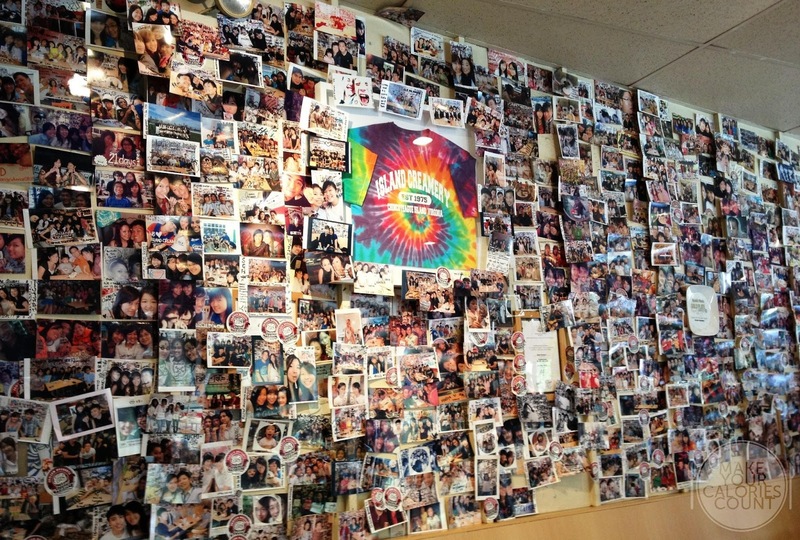 Being one of my personal favourite ice cream places, it was definitely worth the time to pay a special visit! 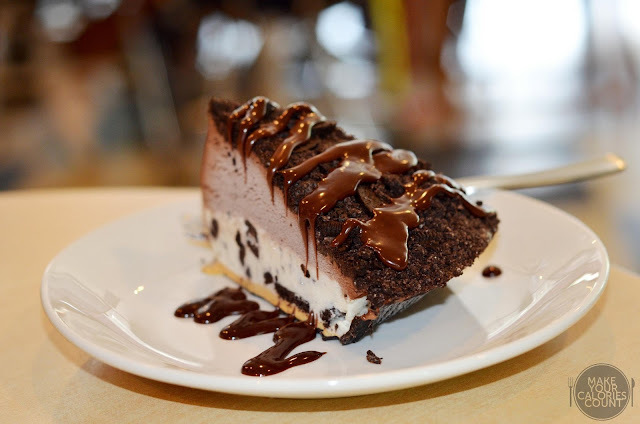 The rich and dense chocolate sauce drizzled across the oreo-topped mudpie slice made us wanna double up the photo-taking and dig into the sinful indulgence. Sandwiched between the oreo bits and the thin layer of biscuit base was a layer of frozen chocolate and cookies & cream cake (ice cream). 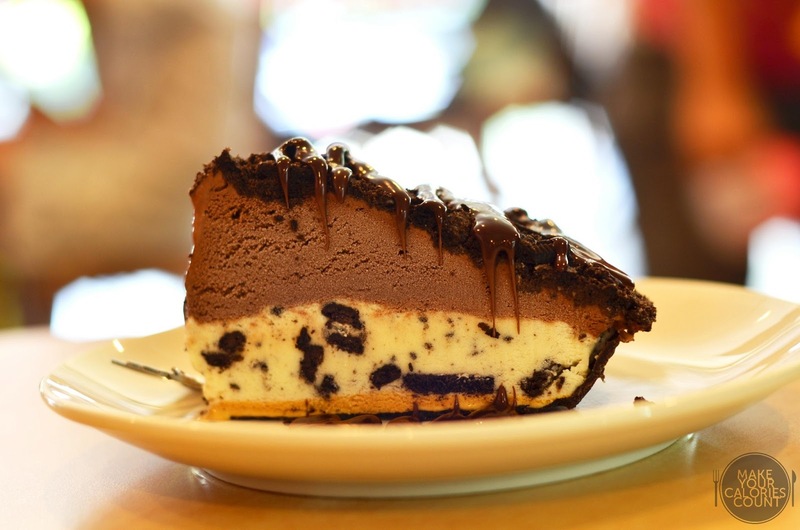 It gave a lovely texture with those crunchy oreo biscuit bits complementing the frozen cake which upon being placed into the mouth, melts instantly. This dessert was definitely not meant for the faint hearted when it comes to the calories meter. There was nothing to fault with the combination with a good balance of bitterness and sweetness from the chocolate and it was simply a pure cocoa decadence. 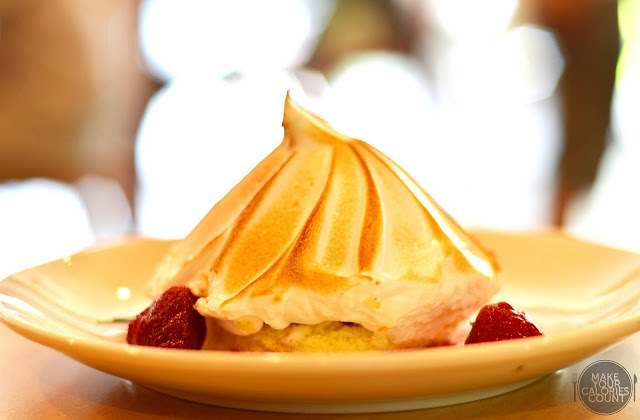 The baked alaska was a classic which had been on the menu for as long as I could remember. 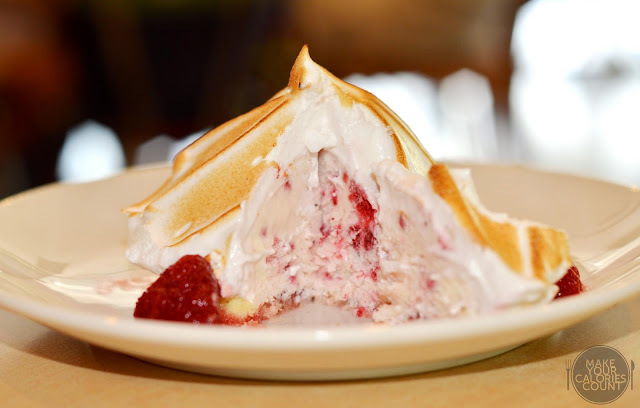 With the 'Very Berry' ice cream centre encased in a gently flambéed fluffy meringue shell, it was a simple yet beautiful dessert. The meringue shell was well whipped which gave the light and fluffy texture. Slicing through is a rich and creamy berry ice cream. There were 2 small strawberries being served together on the plate with some strawberry purée drizzled across. While the ice cream had a strong milky flavour and had bits of the berry fruit, the taste was well within expectations and nothing to be worth excited about. I might have some problems trying to finish this dessert on my own for the creaminess from the meringue was quite satiating on my appetite, but thankfully it was shared between 2 people. Even so, we struggled a little to finish it off. Overall, we loved the appearance of the dessert but we were not too impressed with the flavours. Patrons of Island Creamery at Serene Centre at least would be awfully familiar with the polaroid or instant camera photographs plastered all over the wall! There are tubs of the freshly made ice cream ready for customers to bring home! There was even a children's bench for the toddlers to enjoy their ice cream! We wanted to try the other ice cream flavours but we were too full from the desserts and also from a hearty lunch earlier so we had to leave that for next time. 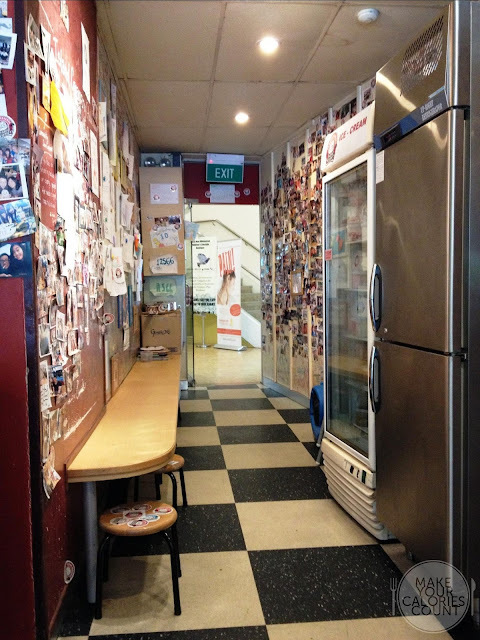 Like most ice cream parlours around in Singapore, Island Creamery had a tank of iced water for the customers to fill at will. The service was okay and the serving ladies were more than happy to let you try out different flavours of the ice cream. The ice cream was priced at S$3.20 per scoop and S$5.20 for a double, which I felt was pretty value for money. 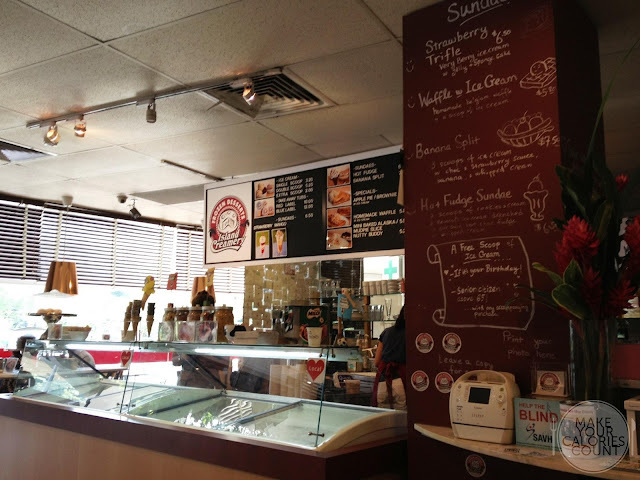 My impression of Island Creamery had not quite changed to be honest, they are still that ice cream parlour which serve honest, quality and premium ice cream but when it comes to flavours, there was nothing too exciting off the menu.